It starts with an itch you just can't shake. Then comes a fever and a tickle in your throat. A few days later, you'll be blabbing your secrets and chatting with strangers like they're old friends. Three more, and the paranoid hallucinations kick in.And then you're dead.When a strange new virus sweeps through sixteen-year-old Kaelyn's island community, everything she took for granted slips away. As the dead pile up, the schools close, the phone lines fail, and the power goes out. Desperate to save her home, Kaelyn joins forces with a former rival and opens her heart to a boy she once feared. The journey they set off on will test her resilience and shake her faith in humankind. 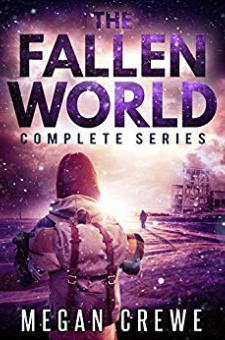 How much of herself will she have to sacrifice to see her mission through?This box set contains the complete Fallen World trilogy—The Way We Fall, The Lives We Lost, and The Worlds We Make—as well as Those Who Lived, the Fallen World story collection.